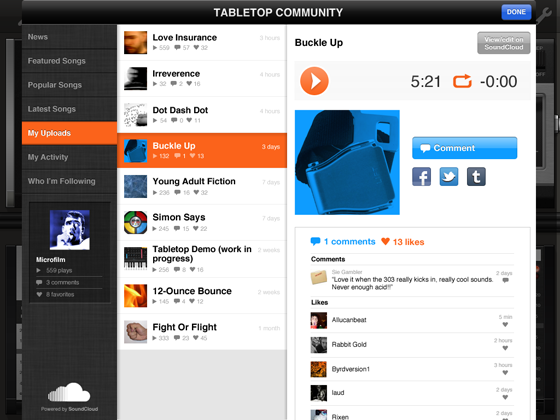 You're probably familiar with SoundCloud's awesome web platform. You can already post your tracks to SoundCloud from apps that have implemented their SDK (like Tabletop), and we're going to take that one step further on iOS. Retronyms is developing an open-source devkit called CloudSeeder that will let app developers add SoundCloud-powered communities to their music and audio apps. As a user, you'll be able to listen to what all the other users of your favorite app are posting. You can follow, favorite, and comment all without leaving the app! When you post your own audio, you'll be sharing with the app community as well as your extended network on SoundCloud and other social sites. The new tools will make their first appearance in future updates of Retronyms apps, but we'll also be packaging the source code as an open-source devkit that all iOS developers can easily customize and include in their own apps. We're also planning to evolve the functionality of the CloudSeeder tools over time, adding new features as they are made possible by SoundCloud and requested by the community, so if you have any feedback on what you'd like to see in the devkit as a user or a developer, please let us know! If you're in Austin this weekend for SXSW, please stop by the SoundCloud Open House, where you can talk to us about this exciting new project, as well as many other cool things we'll be announcing in the coming days! This is really cool! I've been wishing SoundCloud would add groups support to the official iOS app. Looks like you guys are moving quicker than they are.